For a homemade gift if you’re not a knitter, sewer, or crafty sort, there is always assembling something in a creative way. 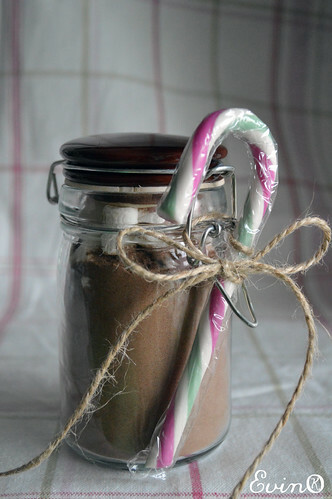 Fill Mason jars of hot chocolate mix for an insanely easy and special mix. For added charm, get an inexpensive tablespoon with a hole in it and tie it to the lid with a coordinating ribbon. Pair with a mug for an ideal office gift exchange present or teacher gift. Or, fill it with tea and cinnamon sticks. I find this a fun gift from September to March here in Ireland since the rain makes it always hot chocolate weather. But if you are, like me, visiting friends over the holidays, a little batch of this makes a thoughtful and unexpected hostess gift and it is different than the usual box of chocolates. 1. Measure out ingredients in the proportions that work for the container you are using. A glass jar is recommended. 2. Sift all ingredients together then carefully transfer into jar. To enjoy this chocolate treat, mix 2 tablespoons with 6-8 ounces very warm milk. Top with chocolate shavings or marshmallows. If you want to make the gift a bit more complete, include a bag of biscoti or marshmallows. Keep in mind, some marshmallows contain animal products as part of the gelatin so that add-on may not be suitable for vegetarians. This entry was posted in Christmas Crafts, Recipes.